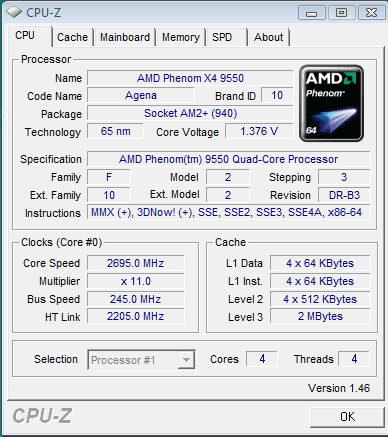 Does the Phenom X4 9350e Overclock Any Better? We've already proved that the 9350e isn't a good value when it comes to power consumption, you're much better off buying a cheaper 9550 and undervolting it, but what about overclocking headroom? 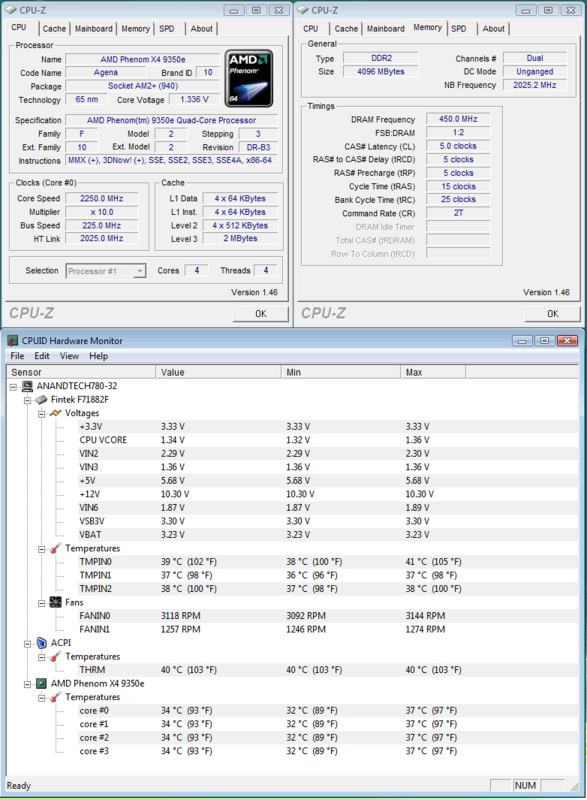 The word frustrating comes to mind when describing our attempts to get a stable overclock on the 9350e. So frustrating that we ended up trying a myriad of different boards based on the 780G/GF8200/GF8300 chipsets before calling it quits for the time being. We still have our 790FX/780a/750a boards lined up for stability testing with initial results showing a definite improvement over the IGP products. But having the capability to overclock this processor more than 20% comes at the expense of a 64% increase in motherboard cost. Plus, this CPU will require a 19% increase in core voltages for that overclock that kinda defeats the whole purpose of purchasing a low power consumption CPU to be utilized in a low cost, low energy integrated platform. In the end, if you want to overclock a Phenom, we highly suggest buying the 9850/9950 Black Edition processors. 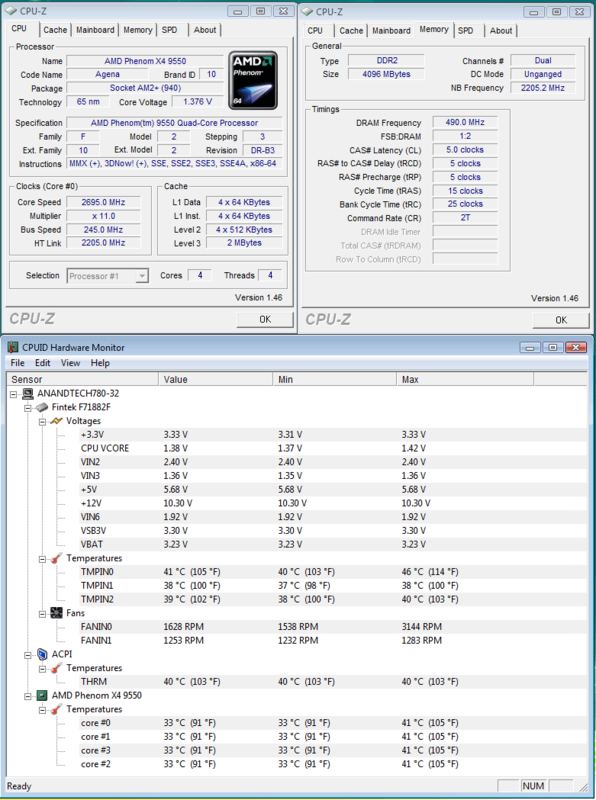 Our final stable overclock on our IGP systems is a whopping, wait for it, 2.25GHz. We could only coax a measly 250MHz increase in speed from our particular sample resulting in a 12.5% core overclock. Granted, this CPU would post at 2.5GHz (10x250HTT) with 1.425V applied to the CPU but we always ended up with a 225HTT to 230HTT setting at the stock 10x CPU multiplier for stability reasons (2.25GHz - 2.30GHz). In the end, our 24/7 setup on either the 780G or GF8200 platform equates to a 2.25GHz processor speed with the NB core clock at a healthy 2025MHz for best performance. We tried lowering our NB core clock to the stock 1800MHz but all we accomplished was decreasing system performance about 3% without any realizing any true increases in overclocking. Even more disappointing was the fact that we had to set our core voltage to 1.350V in order to maintain stability throughout testing. We will reserve our final comments until we have additional samples of the 9350e series. However, at this point, either support in the IGP BIOS releases we have is still immature or more than likely; these processors cannot pass for a 9550 bin speed while being culled out for their 65W TDP capability. Speaking of the 9550, our retail sample overclocked from 2.2GHz to 2.695GHz for a respectable (for Phenom) 22.5% in core speed. This required an increase in core voltage to 1.40V. We tried in vain to get above 2.7GHz with this CPU without going crazy on the voltages. It would POST at 11x260 on 1.425V with a NB core clock around 2080MHz, but the 24/7 stability target meant a reduction in HTT bus speed to 245MHz but with the NB clock at 2205MHz, not bad for a 780G platform. On our 790FX platform, this same CPU is capable of a 24/7 setting at 11x255 (2.8GHz, 27.5% improvement) on 1.400V with a 2295MHz NB clock speed. The 9950BE overclocking results are coming in a different article. Unfortunately, our 790FX boards (they have been beat on for six months) were not exactly up to speed and we thought it would be better to not show anything instead of a 2.8GHz clock that obviously is not representative of the processor at this point. Also, most of our previous results were run on the 780G, a chipset that when tuned correctly and on a good board will outclock the 790FX with a discreet graphics card by the way. Jetway just released a fairly comprehensive BIOS for their new 780G we ended up using after the others started failing. We just received BIOS updates for the 780a boards and have a new 790FX/SB750 arriving shortly for a CF/SLI update on AMD (gaming is not that bad by the way on the Phenom for the mid-range market). why didn't you include the 9950 in the first page of benchmarks? is the 9960 a new processor from AMD? I think they scale much better then that hothardware got the 9950be to 3.1ghz barely even trying and the 9350e to 2.7ghz.